Hanoi (VNA) – A delegation of Ho Chi Minh City led by Vice Secretary of the municipal Party Committee Vo Thi Dung paid an official visit to Cuba from April 4 to 7 to explore potential for cooperation with localities of the Caribbean country. 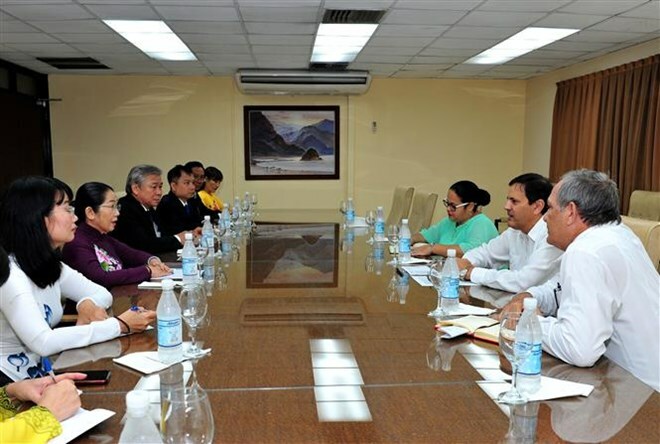 At a meeting with Juan Carlos Marsan Aguilera, deputy head of the department for external relations of the Cuban Communist Party Central Committee, the two sides reviewed the traditional relations which serve as a solid foundation to strengthen the Vietnam-Cuba comprehensive cooperation. They also informed each other of recent accomplishments in their respective countries’ socio-economic development, as well as outstanding challenges and the situation in their respective regions. Dung introduced HCM City’s advantages and fields with huge potential for cooperation. While in Cuba, the HCM City delegation held a working session with the country’s Ministry of Foreign Trade and Investment and visited Artemisa province, home to a village named after Vietnam’s Ben Tre province, which has engaged in friendship with Vietnam for decades.